Sherlock Holmes is one of the most iconic and lasting figures in literature. His feats of detection are legendary, and he continues to capture audiences today in stories, movies, and on TV. 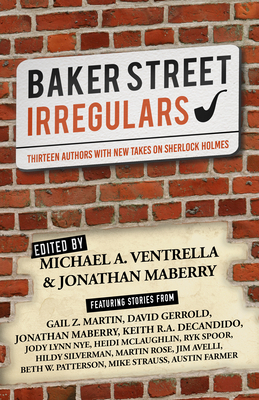 In this new anthology, Baker Street Irregulars, authors present the celebrated detective in more than a dozen wildly entertaining new ways. In Ryk Spoor's thrilling "The Adventures of a Reluctant Detective," Sherlock is a re-creation in a holodeck. In Hildy Silverman's mesmerizing "A Scandal in the Bloodline," Sherlock is a vampire. Heidi McLaughlin sends Sherlock back to college, while Beth Patterson, in the charming "Code Cracker," turns him into a parrot. The settings range from Russia in the near-future to a reality show, from a dystopian world to an orchestra. Without losing the very qualities that make Sherlock so illustrious a character, these authors spin new webs of mystery around their own singular riff on one of fiction's truly singular characters. "Code Cracker" by Beth W. Patterson.